It’s hard to believe we are heading into the second month of autumn when for many of us it feels as though summer hasn’t yet ended. Next month we will start to see a change in our evenings as Daylight Savings ends and we lose the extra hour of daylight after working-hours. Next month we will also see a change in the Office of Ethnic Communities as I take up a secondment to the Private Secretary role to our Minister. I am very excited about this opportunity which will provide me direct access to support better our Minister and his team. It also gives me the chance to learn about our Minister's world and its impact on wider machinery of government – all of which puts me in a stronger position to support the efforts of the Office of Ethnic Communities. I am pleased to announce that Maarten Quivooy, GM for Regulatory Services at Internal Affairs will take on the role of General Manager for Office of Ethnic Communities. I have worked alongside Maarten for many years and firmly believe that his wisdom and expertise will ensure we get the right balance of focus and effort in the Office for Ethnic Communities to support the Minister’s goals and deliver the best outcomes for our people and the ethnic communities we serve. There are developments in the landscape both internationally and in New Zealand, that make it important for Office of Ethnic Communities to be working closely with partner agencies on policy issues that impact ethnic peoples and communities. I am confident these changes will strengthen Office of Ethnic Communities’ position as we begin to capitalise on these strategic opportunities that lie ahead. These new arrangements will take place on 11 April and your continued support while we work these changes with minimal disruption would be deeply appreciated. I look forward to reading April’s Office of Ethnic Communities update where Maarten will introduce himself and his aspirations for Office of Ethnic Communities over the coming months. This month we launched the Community and Heritage Language Celebration Guidelines. This is a resource for you and your community to e explain the process of planning a language celebration. 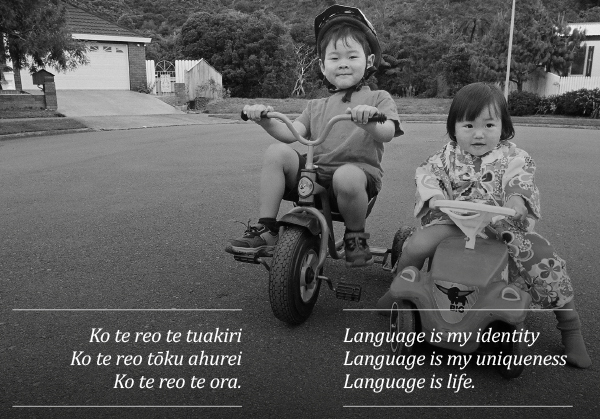 New Zealand is home to more than 160 languages and this incredible cultural and linguistic diversity makes New Zealand a better place to live. We developed the guidelines to recognise the importance of communities celebrating, maintaining and sharing their language and culture. The guidelines cover key questions that are likely to arise when planning a language celebration, such as where to start, who to involve, what to include, when to hold an event, how to find support and how others have developed language celebrations. The guidelines are a practical guide that can support your community to organise any event that celebrates and raises the profile of your language, from a community language film screening to a language week. Check out the guidelines and get started planning a language celebration with your community! EPICNZ is returning 27 May 2016, with a key focus on Innovation, Diversity and Building Connections. EPICNZ (Ethnic People in Commerce New Zealand) is an annual conference facilitated by the Office of Ethnic Communities to bring together New Zealand’s business people, ranging from those at the outset of their business careers to experienced leaders. explore potential markets and trading opportunities. We seek to ensure that the annual conference is made up of a diverse range of participants who can network and learn from one another. Every year our audience is made up of a range of business leaders and representatives, including small business owners, SME’s (Small Medium Enterprises), commercial enterprises, academic institutions and relevant government agencies. EPICNZ is not only an opportunity for ethnic business leaders to network with one another, but a platform to build connections between the ethnic business community and mainstream, Māori and Pacific businesses. We hope you will take this opportunity to join us at this complimentary event. Last weekend (19-20 March 2016) The Office of Ethnic Communities ran the Mana Tangata Community Leadership Programme at Massey University’s Albany campus. This is a pilot programme aimed to support diverse ethnic representation and visibility across the public sector. 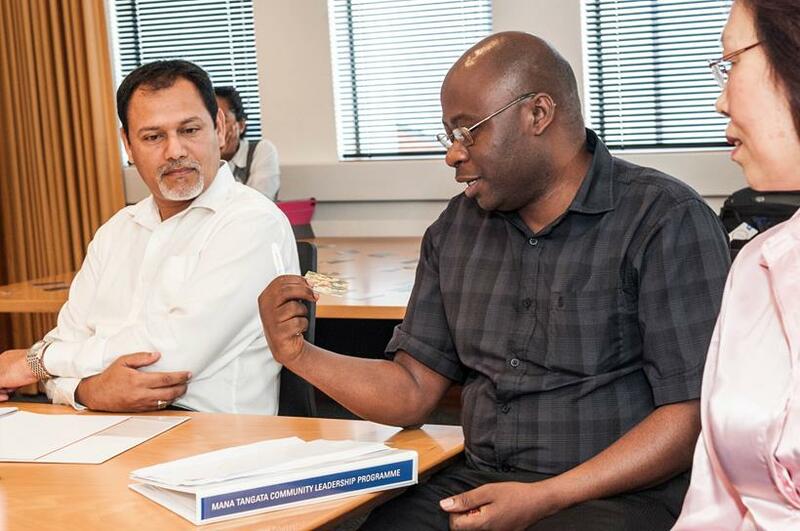 Fifteen candidates were identified by Office of Ethnic Communities and invited to attend the programme which focused on the core skills required for public sector governance roles such as financial management, public relations, people leadership and sustainability. Dr. Pushpa Wood led the session in conjunction with various lecturers from Massey University. There were eight female and seven male attendees including representatives from Burundi, West Indies, Guyana, Korea, Malaysia, China, India, Philippines and Bahrain with an age range from late twenties to mid-sixties. Auckland Councillor Arthur Anae was also present on Sunday and there was an opportunity to discuss with him, how to become more visible on local boards and councils. It was a very full, intense and robust two days and the evaluations and collated feedback will determine our next steps as the leadership team and as an Office. After the programme we filmed ten different ethnic leaders response to leadership. The footage will be available on Office of Ethnic Communities’ website soon. We are in the final stages of Settling In funding round with $204,250 available. Settling In funding supports projects that produce benefits directly for ethnic communities and enables the successful settlement of people from refugee and migrant backgrounds in New Zealand. Updates to Settling In for this funding round have included a more ‘user friendly’ online service for our stakeholders and extra advisory support for applicants. Almost 90 funding requests have been received to date – with the funding round closing on TODAY. The Settling In funding allocation panel meets in late May. Thank you to those organisations that have applied for funding – we look forward to contacting you in mid-June to discuss the outcome of your application. The Office of Ethnic Communities is working with the New Zealand School Trustees Association and Multicultural New Zealand to support greater ethnic and cultural representation in school trustee elections in May-June this year. School trustee elections are one of the most significant democratic processes in New Zealand, involving the election of boards of trustees for almost 2,500 state and state-integrated New Zealand schools, every three years. More than 15,000 people are needed to form boards, and more than 110,000 people have taken on the trusteeship role since 1989. The board of trustees has overall responsibility for the governance of a school. It sets the educational goals and strategic direction of the school, and then monitors performance against these. The board of trustees makes sure that students are achieving, that the school complies with the law, and that the school is a responsible employer. Crucially, the board should also represent the diversity of its school community. This is important because it encourages greater cultural responsiveness in schools, which in turn benefits the whole community. We are encouraging people from ethnic communities to consider becoming a school trustee. Eligibility criteria apply but trustees don’t have to be parents, and don’t have to have children at the school they stand for. It is an incredibly valuable role and one that gives you a real opportunity to give back to your community, and shape young lives in a positive way. We encourage you to consider standing for election if you have skills to share and would like to be involved in schools putting students at the centre of every decision they make. The speech awards provide an opportunity for students to develop the key competencies such as thinking skills, managing self, relating to others and participating and contributing. Stand up for race unity – don’t be a bystander! What does ‘standing up for race unity’ mean to you? What are the consequences of being a bystander? How can you inspire others to ‘stand together’ for race unity? What would ‘unity in our midst’ look like? Regional heats were held on 22 and 23 March. Regional Semi Finals will be held on 4 April and finals on 6 April. National Semi Finals 8 April, St Columba Centre, 40 Vermont Street, Auckland with Finals being held on Saturday 9 April, Te Mahurehure Marae, 73 Premier Avenue, Pt Chevalier, Auckland. 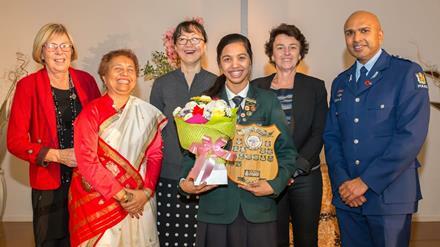 Caption: Kimberly D’Mello of Aquinas College, Tauranga, who won the competition in May 2015, photographed with the judging panel. 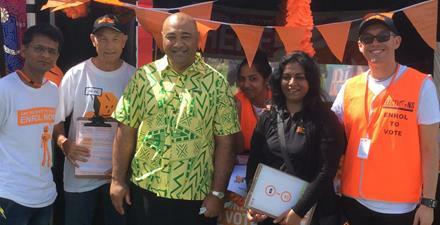 This month Office of Ethnic Communities attended the 17th annual Auckland International Cultural Festival held at Mount Roskill War Memorial Park. The Festival is a well-established key Auckland multicultural event organised by Auckland Council. Minister for Ethnic Communities, Hon Peseta Sam Lotu-Iiga attended the festival and spoke about the value of celebrating and embracing cultural diversity. This year’s festival featured a showcase of over 50 ethnicities, with more than 100 stalls. For the first time ever, the West Indian and Caribbean Society were represented at the festival. The society received partial Settling In funding for their activities at the festival and were a hot favourite this year with many of the attendees. The one day free event featured a mix of cultural food, performances, costumes and sights from around the world. The festival also included a soccer tournament with teams representing Somalia, Rwanda, Burundi and Afghanistan among many other ethnicities. The Refugee Youth Action Network (RYAN) team beat team Burundi in the final through a penalty shootout. The RYAN team included players of diverse ethnicities and of former refugee background. On 5th March, the New Zealand Chinese Students’ Association (NZCSA) held its 20th anniversary celebration at the University of Auckland. 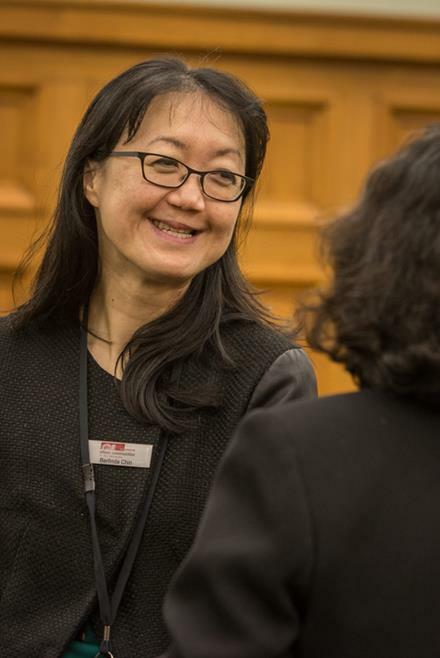 Ms Naisi Chen has been officially appointed as the NZCSA's President for 2016. The celebration showcased the significant achievements and projects of NZCSA over the past 20 years and introduced its governance and future organisation priorities. Over 180 attendees were present including representatives from NZCSA, University of Auckland, Consulate-General of China (Auckland), the Chinese community, local and central government agencies and the business sector. NZCSA was established in 1996 as a student initiative to connect the Chinese students in New Zealand. These students had a shared vision to create a platform to provide their members with opportunities to expand their knowledge, skills and capabilities as well as network. For 20 years, NZCSA has been instrumental in connecting Chinese students with the rest of New Zealand society and acts as an advocate of Chinese culture in New Zealand. 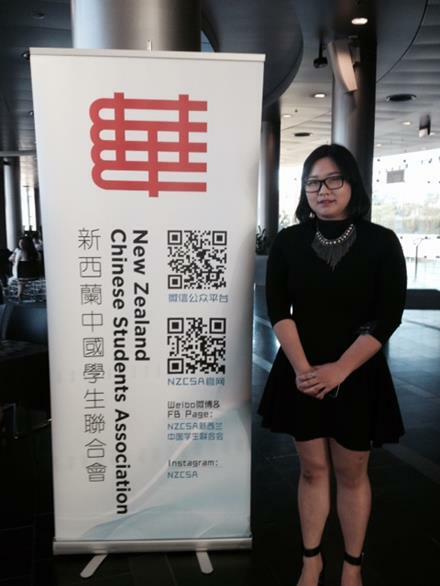 NZCSA has become the largest Chinese students’ organisation in New Zealand. Keep up to date with our projects and ethnic diversity issues by subscribing to our contact list. Email ethnic.communities@dia.govt.nz. You'll receive details about stories, events and community news by email. This includes our monthly newsletter the OEC Update.